After working in the corporate and non-profit worlds for many years, I began painting full-time in 2002. I live and work in the city of Albuquerque, having moved here in 2013. I’ve lived in cities throughout the US and one in Canada, providing me with the opportunity to study at several schools & studios including the Art Students League of New York (NYC), Palette and Chisel Art Academy (Chicago), Vancouver Art Guild (British Columbia), Brookline Arts Center (Brookline, MA), and the University of Minnesota (Minneapolis). My degrees are a BS in business administration (Univ Of Minnesota) and an MS in historic preservation (Univ. Of Vermont). Painting for me is a problem solving process as well as a means for artistic expression. I manipulate forms and colors, exploring the way they work together on the canvas, whether they are part of a still life, landscape or life study. My goal is not necessarily to represent something realistically, but to make the elements of the painting work together, providing what I hope will be an engaging, lively experience for a viewer. I often use a photo as a starting point for my compositions, considering the reinterpretation of the scene to be part of the creative process. I like to work quickly and as loosely as possible, and by using acrylic paints, which are fast drying, I find that I get the most satisfying results. I enjoy traveling with my family and frequently find inspiration for my work in the places I visit. 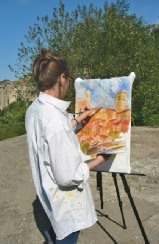 Plein aire painting in Italy.